One day in August this year, I received a piece of mail. It looked a little different to the average car-related sales flyer. 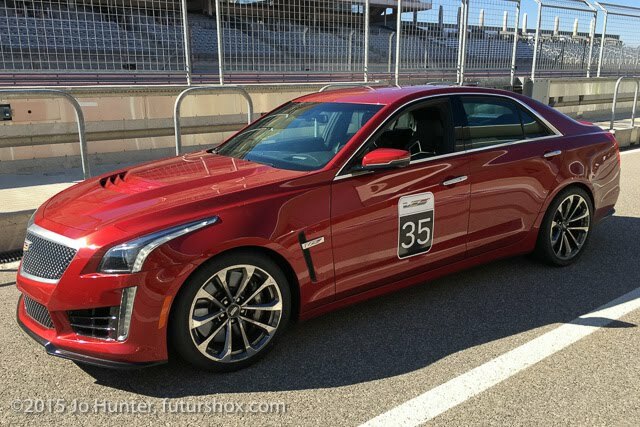 This was elegant, glossy and appeared to be an invitation from Cadillac to join them at the Circuit of the Americas (COTA), to drive their hot V-series cars. Fully catered, hands-on driving and at no cost to myself. My first reaction was, "Wow, this looks amazing! ", followed closely by "Is this for real?". Well apparently it was. Fast forward to December and I'm waking up early, unable to sleep, and found myself pitched up at the COTA gates at 06:45, waiting to get in. We were an interesting assortment of vehicles; from tricked-out trucks to Porsche 911s and my Jeep; doing follow-the-leader behind the staff Escalade, who led us into the far end of the main paddock, where we parked up near the Media Center. There was a line of cars waiting for us, getting their engines warmed up. A line of cars, all purring away. Inside the Media Center, we signed in, and were shown into one very large room which was laid out with a very nice breakfast to one side, and a stage in the middle. One of each type of car was parked either side, looking all shiny. Lots of tables and chairs awaited us; lots of people gathered inside. An interesting crowd. Many folks were obviously into their racing, and lots of folks seemed to know each other. I'm really wondering now how I got so lucky to be invited; I'm one of about five women amongst the hundred or so people here, and definitely not in the racing crowd. Still, no point worrying about that! I'm glad to be here. Many more chairs and tables are out of shot; they all were filled soon enough. After a welcome and safety brief, they split us into three groups. 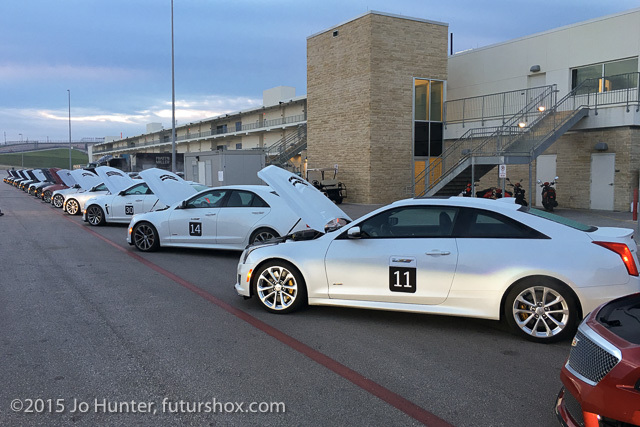 Our group was assigned to a batch of mostly CTS-Vs, and I happened to get into one of the two ATS-V cars in the pack. We conga-lined out of the paddock area, back out the main gate and up to one of the parking lots behind the long straight. This was good, since it gave me a chance to get a feel for the ATS-V under normal driving conditions. Now, let's have a look at this car. The smaller of the two V-series cars, this is fully track capable and has a 3.6L twin turbo engine, making 464 hp and producing 445 lb.-ft. of torque. An ATS-V, showing off its bonnet vents. I could feel already that this car wanted to Go. That said, it was perfectly docile to drive around at normal speeds. It felt very poised and solid, easy to steer and was very pleasant. This one (like all the cars here today) had an automatic transmission; a quick-shifting eight speed that felt very responsive. I was glad of this; much as I love driving stick shift, it was one less thing to worry about in an unfamiliar environment. We arrived at a small drag racing strip, where they split us into two lanes and we paired up for some races. It was only a hundred yards or so. Hammer down, followed by a quick stop in the box. Since this was my first time putting any hammers down in this type of environment, I was resoundly beaten by the other ATS-V. Never mind! We lined up for part 2; a slalom around five or six cones. They told us to use only the throttle, not the brakes. The car handled beautifully around the cones; it is quite nimble. Then we each had another go. For this time around, the staff introduced us to the different modes in the cars. We'd been operating in Tour mode. Now they put us into Track mode, which tells the car to give us everything it's got (while still maintaining traction control and all the other good things that keep us safe). My second drag race was faster but I still got beaten. It felt much more sprightly though, and my stop was better. These cars have big Brembo discs and they do appear to work pretty well. And the difference in mode made itself felt in the slalom too, it felt even more nimble and quick around each cone. A nice introduction to the car. ATS-V cockpit. 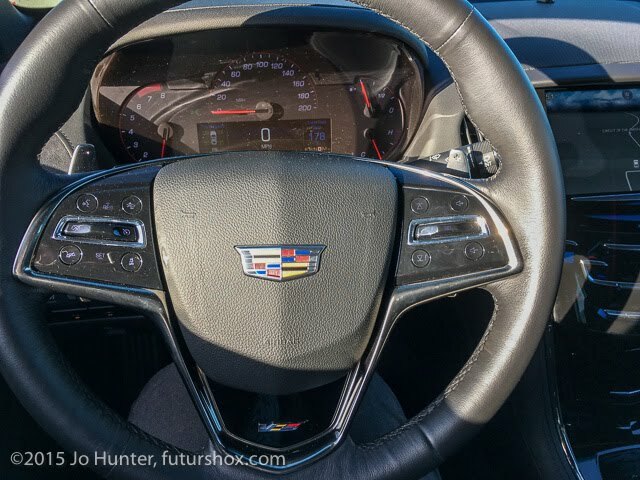 The CTS-V is similar, although a few switches move to the center console in that car. Both models of car here today have this nifty head-up display. I've highlighted it here inside a brighter circle; you can see the mph and rev counter right in front of you, which is great. 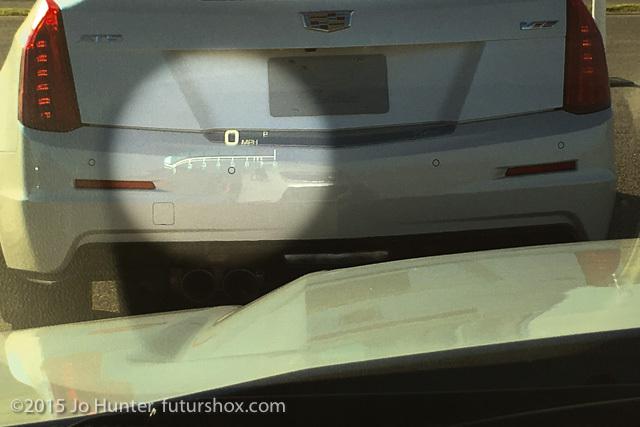 Head-up display, highlighted in the circle. It floats just below your main line of sight. We drove back into the track, and they led us to the support paddock in the middle of the track for some Autocross action. We swapped cars with another group; they drove ours away and we had a brace of ATS-Vs to play with. If you've never seen autocross, it's where you have to drive around a very small course made of tape and cones, with narrow track width and lots of corners, some of them very sharp. There was a start gate and a finish box, and a timer. There were fewer cars here so we paired up. A fellow named Rob drove our car first, while I rode in the passenger seat. He absolutely caned it; really throwing it around the corners and squirting it down the short straights. Lots of revs and squealy, chirpy tyre noises. G-forces throwing you left and right. He did the course in 27 seconds. I owe him a debt of thanks, because I'm pretty sure that if he hadn't shown me what the car could do, I wouldn't have been nearly as aggressive when it came to be my turn. Now, this was fun! I drove that course absolutely secure in the knowledge that the car could take anything I did with it. So I did my best to emulate Rob, having never driven like that in my life. My first lap, I did something over 30 seconds. Some of it sideways, and certainly at strange angles. Second lap, 30.6s. Messed up a corner or two, but sailed around some others. Third lap I really went for it and managed 29.6s. I was happy with that! All this showed me that the ATS-V is certainly a highly capable machine; even thrown around as it was, it didn't miss a beat and felt controlled all the way. Looking down the start of the Autocross track. The finish is out of frame to the right. Back to the main paddock, where... drumroll please... it was Track Time! Yes, we were about to get a taste of driving around the world-class track that is the Circuit of the Americas. I think it's fair to say I'd been looking forward to this, no doubt along with everyone else. 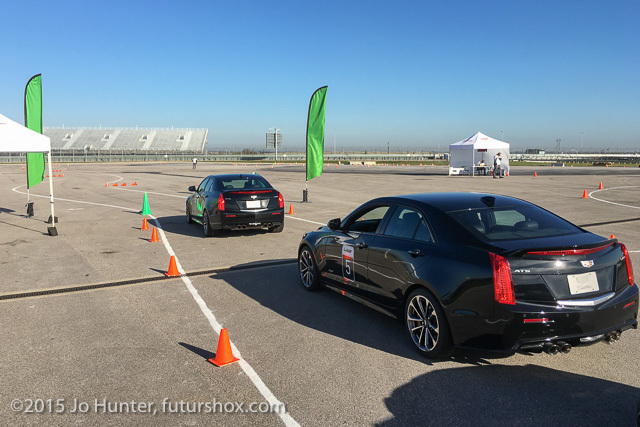 First up were some laps in the ATS-V. They took us out in little packs of cars; one instructor with three students in trail. They had a neat system where the instructor has a radio, and the sound comes through on our car stereos. This was cool since he could talk to us all the way around the circuit. We also had a video log. 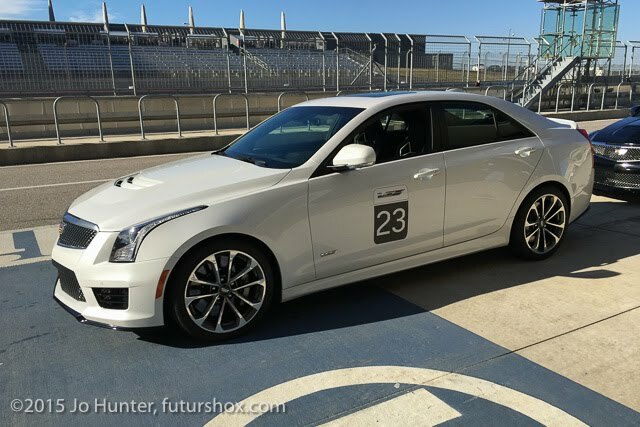 Each car had the (optional) Cadillac Performance Data Recorder. This is a cool thing; the car has a camera in front and a brace of sensors, which records a video with a data overlay onto an SD memory card which slots into the glove box. The lanyards we'd been given earlier had SD cases attached to them; once we'd done driving on the track, we took the SD card out and kept it. I was first in line behind the pace car to begin with. We pulled slowly out into the pit lane and headed towards Turn 1. As we exited the pit lane, I realized the instructor really wasn't hanging around, and I'd better keep up! They wanted us to keep 3-4 car lengths between each of us, which turned out to be easier to achieve in some places than others. Up to Turn 1, around that hairpin at the top, bring it left again down into Turn 2 and gather speed into the S's. He kept it slower to begin with (although it seemed pretty quick to me) and since we were able to keep together as a group, he increased the pace. Zoom up Turn 9, accelerate past Turn 10, stand on the brakes for the hairpin at Turn 11 and a smooth turn in to the straight. He had me pull over to let the other cars move up, then I joined on to the back of the pack. Pedal to the metal to catch up again. Now we're moving! 118mph as I caught up to the group. I did not make an awesome job of rounding Turn 12, and was given some advice about that. We made it around the tricky complex through the grandstand area, then into that long sweeping right hander around the base of the Tower, before making a left, then another left, which put us back onto the start/finish straight. Everything so far had been a total sensory overload. I was registering the apex cones, and the braking zones. Not sure I ever spotted the turn-in markers. All senses were totally on the job at hand; getting the car around the track smoothly and rapidly and not falling back from the guy in front. However, this bit of track did involve a straight line for a few seconds, and I allowed it to hit me that here I was, driving at 114 mph down the friggin' Circuit of the Americas! It felt amazing. And then we were off for our second lap. This involved more of the same, except a bit faster (125mph down the straight!). Another lead change put me into Car 2 position, and I made a better turn around 12. Then it was back into the pits. Stepping out of the car, I was shaking from the adrenaline. We'd only been out on track for eight minutes but that was seriously intense. A cool down was required. They guided us inside, where we could grab a very welcome drink, and then give our SD cards to some folks who were clipping little segments from the video for us to be able to post on social media. This was a neat operation. They pushed the video clips across to iPads, where we could take care of logging in to our various networks. 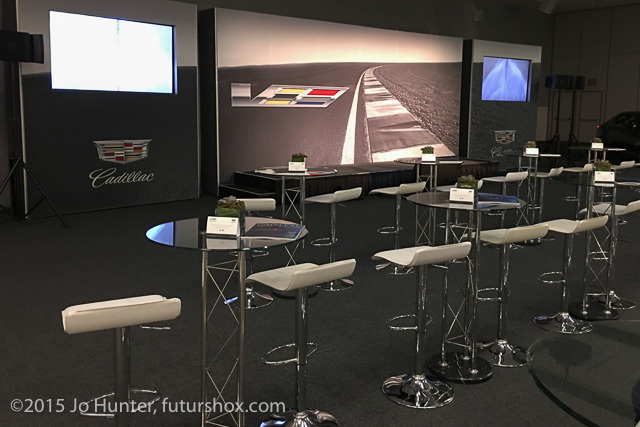 They transformed some pit garages into a Cadillac comfort zone. We then had a classroom session, where we learnt some things about track work and how to corner properly. 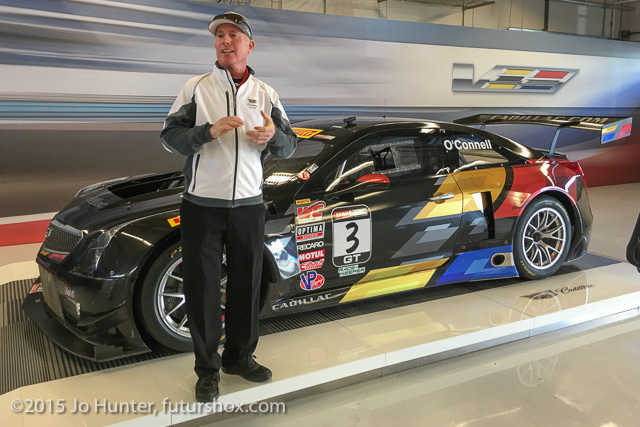 After this, we were able to have a brief Q&A with Johnny O'Connell, one of the works Cadillac racing drivers. He seemed like a very pleasant guy, and he's been doing well - he won the Pirelli World Challenge series this year in his ATS-V.R. 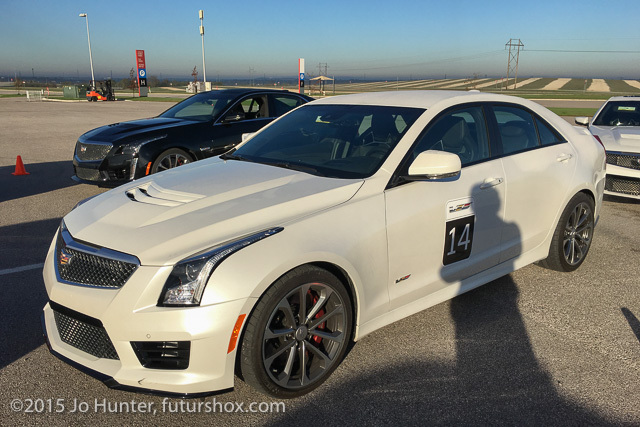 After a little while, it became time for our group to venture back out onto the track, this time in the mighty CTS-V. This is a monster car, with a supercharged 6.2 litre V8 engine, and an 8-speed auto transmission. It makes 640hp, 630 ft/lb of torque, some really excellent noises, and is capable of 200mph. A big, powerful car, which I'd never driven before in my life, and I was about to thrash it around a racetrack. Hm! The CTS-V. Doesn't it look pretty? I just love those Cadillac vertical lights, they give the cars a huge presence. I was at the back of the pack this time. We set off up the pit lane again, and I suddenly realized the rest of the pack was disappearing up the hill somewhat more rapidly this time. Oh yes, this car accelerates alright! Catching up at Turn 1, we swooped down the hill and set off around the track at a noticeably faster pace than earlier. This car felt much heavier in general; it has massive amounts of power but felt a little less nimble around the corners (or maybe it was just my dodgy cornering). I found myself falling behind the others a bit more than I should have done; when we got to the hairpin and did the driver order change, I had to really floor it to catch up. However this gave me the opportunity to experience doing 139mph down the main straight! Holy cow, this thing moves. It felt like there was plenty more to come too, but we were running out of straight line road. I definitely didn't do as well at some of the corners this time around. 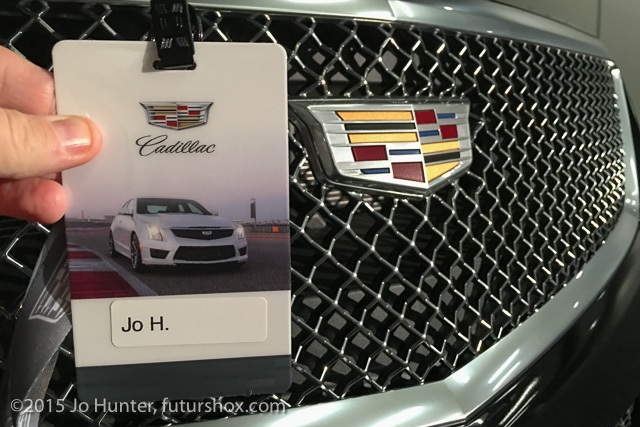 I don't know if it was because I hadn't driven the CTS-V earlier in the day and wasn't as familiar with it; I mean it really did feel like a lot of car to hustle around, but more likely I just have a lot to learn. I regret that I don't have the driving experience to fully appreciate what is obviously an extremely potent car, but hopefully the lessons I've learned here will help if I get to do this kind of thing again sometime in the future. That said, it was still an absolute blast and a great experience to drive. We did three laps altogether and it was awesome. Cooling down again after this session, some more time spent with the media card people and in the classroom again, learning about the different systems on the V-series cars. 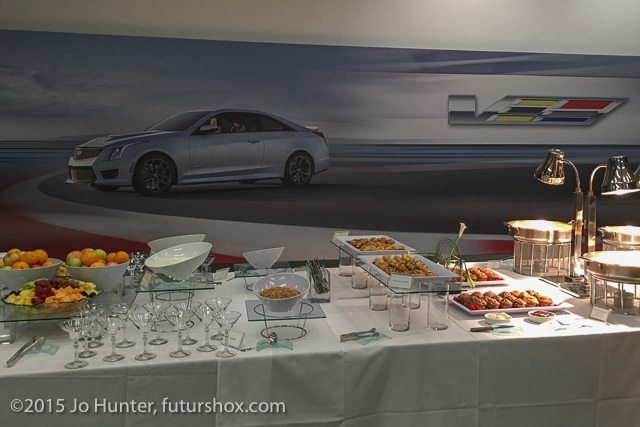 A last thank you and farewell from the Cadillac folks and we were done. My thanks go right back to Cadillac for such a fabulous morning. Y'all have some excellent cars; I hope I get to drive them again.